Recent Entries to this Blog Is It Really.....? Sometimes our favorite perennials become welcome and not so welcome weeds in our gardens. As our extended summer continues I was out moving two hydrengeas that were not working in the beds I had planted them in. 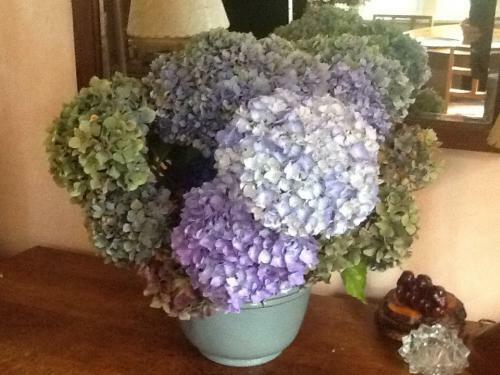 Picked many of the blooms and brought them in. A little color added to other bouquets in the living room. The hydrengea plants were severely cut back to the ground and moved to other beds in the garden. Hopefully they will survive. I did a bit of weeding of perennials gone wild. The pink blooming strawberries, phlox, and lambs ears got tossed into the green bin. I have been doing lots of perennial moving and will undoubtedly be surprised next summer with where I have placed plants. Some may not survive, like last springs dahlias, and I'll wonder what the heck happened. Also picked up a few sun-chokes at the farmers market. Planted them where I could enjoy the flowers and have the tubers for some winter digging. I like having cole crops in winter. There is always some security in having fresh food in the garden waiting to make a meal. It's that time of year. Here the actual moving will come in another couple of weeks, but I am already out there looking and planning. I have some plans already. I would like to see some pics from out in your garden now. Fall has a charm all its own.